Holocaust, pronounced HAHL uh kawst, was the systematic, state-sponsored murder of Jews and others by the Nazis during World War II (1939-1945). The Nazi dictator Adolf Hitler wanted to eliminate all Jews as part of his aim to conquer the world. By the end of the war, the Nazis had killed about 6 million Jewish men, women, and children--more than two-thirds of the Jews in Europe. In addition to Jews, the Nazis systematically killed millions of other people whom Hitler regarded as racially inferior or politically dangerous. The largest groups included (1) Germans who were physically handicapped or mentally retarded, (2) Gypsies, and (3) Slavs, particularly Poles and Soviet prisoners of war. Nazi victims also included many homosexuals, Jehovah's Witnesses, priests and ministers, members of labor unions, and Communists and other political opponents. Historians estimate that perhaps as many as 11 million people were killed, including the Jews. Many of the Holocaust victims were killed in specially constructed gas chambers, and their bodies were then burned. The word holocaust means a sacrificial offering that is completely burned. The Jews had faced persecution long before the Holocaust began. Anti-Semitism (prejudice against Jews) has existed since ancient times. Many early Christians mistrusted Jews because the Jews remained faithful to their own traditions and refused to convert to Christianity. In the mid-1500's, the religious reformer Martin Luther issued ferocious attacks against the Jews for not adopting his new religion. He referred to the Jews as "venomous" and called for violence against them. In many cities, the Jews were forced to live in separate communities called ghettos. They had to pay special taxes, and they were not allowed to own land or to enter certain occupations. In the 1800's, many people began discriminating against Jews on racial rather than religious grounds. Many anti-Semitic writers insisted that Jews were an inferior race. Anti-Semitism became a powerful force in European politics. Many people considered the Jews responsible for society's troubles. In 1881, for example, when revolutionaries assassinated Czar Alexander II of Russia, the Jews were blamed. Many Russian Jews were then killed in organized massacres called pogroms. In 1894, Captain Alfred Dreyfus, a French army officer and a Jew, was accused of selling military secrets. Although the case against Dreyfus was weak, a court-martial condemned him to life imprisonment. After the verdict was announced, his opponents chanted in the streets, "Death to Dreyfus! Death to the Jews!" In 1906, he was cleared of all charges. Adolf Hitler, the leader of the Nazi Party, became head of the German government in 1933. He quickly moved to make himself a dictator. Germany's defeat in World War I (1914-1918) and a worldwide depression in the early 1930's had left the country's economy in ruins. Hitler blamed the Jews for Germany's problems, and he made anti-Semitism a government policy. On April 1, 1933, Hitler's government sponsored a nationwide boycott of Jewish stores and other businesses. In the next several months, the government passed a number of laws that barred Jews from specific occupations. Jews were excluded from civil service, for example, and from the fields of education and culture, and they could no longer farm the land. The Nuremberg laws of 1935 stripped Jews of citizenship. Jews were forbidden to marry non-Jews. The laws set forth definitions of who was a Jew and who was a part-Jew, also known as a Mischling (mixed blood). For example, a person who had at least three Jewish grandparents was classified as a Jew. Someone with one Jewish grandparent might be classified as a Mischling. In the next three years, the Nazi government continued to deprive Jews of their rights and possessions. Jews could not sit on park benches or swim in public pools. The government seized Jewish businesses as well as personal property. The discrimination was an effort to force Jews to emigrate so Germany would be Judenrein (free of Jews). Thousands of Jews did leave the country, though they were permitted to take little with them. But many Jews were trapped because other countries would not accept them in large numbers. The Nazi persecution reached a new height on Nov. 9, 1938. Beginning that night and continuing for about 24 hours, Nazis destroyed thousands of Jewish-owned businesses and burned most synagogues in Germany and Austria. They beat Jews in the streets and attacked them in their homes. They killed dozens of Jews. They arrested about 30,000 Jews and sent them to concentration camps (camps for political prisoners). The night became known as Kristallnacht, a German word meaning Crystal Night. In English, it is called the Night of Broken Glass. "The Final Solution." After World War II began in 1939, Germany's powerful war machine conquered country after country in Europe. Millions more Jews came under German control. The Nazis killed many of them and sent others to concentration camps. The Nazis also moved many Jews from towns and villages into city ghettos. They later sent these people, too, to concentration camps. Although many Jews thought the ghettos would last, the Nazis saw ghetto confinement as only a temporary measure. Sometime in early 1941, the Nazi leadership finalized the details of a policy decision labeled "The Final Solution of the Jewish Question." This policy called for the murder of every Jew--man, woman, and child--under German rule. The slaughter began with Germany's invasion of the Soviet Union in June 1941. Special squads of Hitler's SS (Schutzstaffel) troops accompanied advancing German forces. These killing squads, called Einsatzgruppen, rounded up Jews, Gypsies, and Soviet leaders, and shot them to death one by one. The face-to-face killing became difficult for the killers, and the Nazis soon sought a more impersonal and efficient method of genocide (extermination of an entire people). They began using sealed vans. The prisoners choked to death on exhaust fumes as the van traveled to a burial pit. At the Wannsee Conference, held in Berlin in January 1942, Nazi leaders further systematized the killing. They decided that Jews throughout German-occupied territory would be evacuated to concentration camps in eastern Europe. These camps would become centers for slave labor and extermination. The camps. The first Nazi concentration camps were organized in 1933, shortly after Hitler came to power. By the late 1930's, the facilities held tens of thousands of political prisoners arrested by the Nazis. In the early 1940's, several new camps were established, with specially constructed gas chambers disguised as showers. For the Jews who had been confined in ghettos, the next step was what the Nazis called deportation. The Nazis herded the Jews into railroad freight cars to be taken to the camps. When the Jews arrived at a camp, an SS physician singled out the young and able-bodied. The others were sent directly to the gas chambers. The guards seized the belongings of those who were to die. As many as 2,000 prisoners were sent into the gas chambers at one time. SS personnel poured containers of poison gas down an opening. Within 20 to 30 minutes, the new arrivals were dead. The guards shaved the heads of the corpses and removed any gold teeth from their mouths. Then they burned the bodies in crematoriums or open pits. The able-bodied prisoners had their heads shaved and their belongings seized. Camp personnel tattooed a number on the arm of each person. From then on, the prisoners were identified by number instead of by name. These prisoners were forced to work long hours under cruel conditions. When they were too weak to work any longer, they too were killed or left to die. There were six death camps, all in German-occupied Poland--Auschwitz, Belzec, Chelmno, Majdanek, Sobibor, and Treblinka. Auschwitz was the largest and most notorious. It was a slave labor camp as well as a killing center. About 11/4 million people were murdered there. Hundreds of other concentration camps operated in Germany and German-occupied territories during the war. None of these camps was established solely for killing, but the conditions in all of them were so harsh that hundreds of thousands of prisoners died of starvation and disease. In some camps, a number of inmates--many of them children--died after Nazi physicians performed cruel medical experiments on them. In the last months of the war, the Allied forces, including American, British, and Soviet troops, swept through Europe. The Nazis hastened to empty some camps to remove witnesses to their cruelty. They crowded camp inmates into boxcars or forced the prisoners to walk to other camps behind the lines. The forced marches, made in winter with few provisions, claimed so many victims that they were known as death marches. Resistance. During the Holocaust, the Nazis kept their actions as secret as possible, and they deceived their victims in many ways to prevent resistance. Initially, the Jews in the ghettos either were not aware of the slaughter planned for them or simply could not believe it was happening. Armed resistance was not the first response of the Jews. They tried to thwart the Nazis by nonviolent means. Also, it was difficult and dangerous for the Jews to obtain weapons. Little help was available to them. Anti-Semitism was widespread, and Jewish resistance did not have popular support. Jewish fighters could not disappear among the population because non-Jews might betray them. Jewish leaders in the ghettos knew that the Nazis could kill everyone in the ghetto in revenge for the actions of a few resisters. But many Jews who managed to escape the ghettos joined secret bands of fighters against the Nazis. And some non-Jewish individuals risked their lives to smuggle Jews to safety. Some Jews in ghettos, slave labor camps, and death camps did fight. 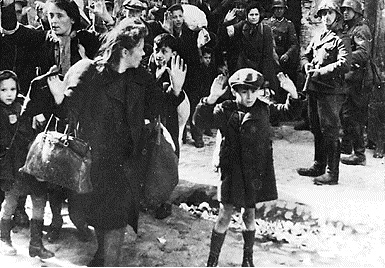 In 1943, for example, thousands of Jews revolted in the ghetto in Warsaw, Poland. Although the Jews were surrounded and poorly armed, they held out for about four weeks. But the Nazis either killed or sent to death camps all of the 60,000 Jews in the ghetto. In a 1944 revolt at Auschwitz, prisoners blew up a crematorium, and a small number escaped. But such resistance was often an act of desperation. It erupted when the Jews understood Nazi intentions and had abandoned hope of survival. The motivation of the fighters was to protect Jewish honor and avenge Jewish death. A Jewish homeland. As the Allies advanced through Europe in 1944 and 1945, they found millions of displaced persons living in countries not their own. Most of these people, including many Jews, eventually returned to their homelands. However, many of the Jews had nowhere to go. Their homes had been destroyed, and their families murdered. The presence of so many Jews on German soil, living among their former killers, pressured world leaders to find a place where the Jews could go. The Jews themselves wanted an independent Jewish state in Palestine, the ancient Jewish homeland in the Middle East. In the late 1800's, members of a Jewish movement called Zionism had begun promoting immigration of Jews to Palestine. In the early 1900's, the British rulers of Palestine had pledged support for a national homeland there for the Jews. But the Arabs who lived in the area had opposed it, and severe fighting had broken out several times during the 1920's and 1930's. In 1939, the British had begun limiting Jewish immigration to Palestine to gain Arab support for the Allies in World War II. Both during and after the war, Palestine's Jews fought bitterly against the restrictions. The British submitted the problem to the United Nations (UN). In 1947, the UN proposed dividing Palestine into an Arab state and a Jewish one. In May 1948, the state of Israel officially came into existence and opened its borders to receive the Jews. The Nuremberg Trials. In the fall of 1943, Allied leaders declared their determination to bring the Nazi leaders to justice for their wartime behavior. The outrage of the Allies only intensified during the final months of the war, when the killing centers were discovered. The Nuremberg trials took place from 1945 to 1949. They were held in Nuremberg, Germany, where the Nazi Party had staged huge rallies. The Nazi leaders were charged with four major types of crimes--conspiracy to commit crimes against peace, crimes against peace, war crimes, and crimes against humanity. Conspiracy to commit crimes against peace included the planning of a war of aggression. Crimes against peace included carrying out such a war. War crimes included the murder of prisoners of war and of civilians, and the destruction of towns and cities. Crimes against humanity included deporting civilians and using them for slave labor as well as persecuting and murdering people for their political beliefs, race, or religion. On Dec. 9, 1948, the United Nations passed the Genocide Convention, which was designed to overcome the claims of Nuremberg defendants that they had violated no law. The convention made genocide a crime. The next day, the UN adopted the Universal Declaration of Human Rights. Contributor: Michael Berenbaum, Ph.D., Hymen Goldman Prof. of Theology, Georgetown Univ. ; Director, U.S. Holocaust Research Institute.